Walk in the park. 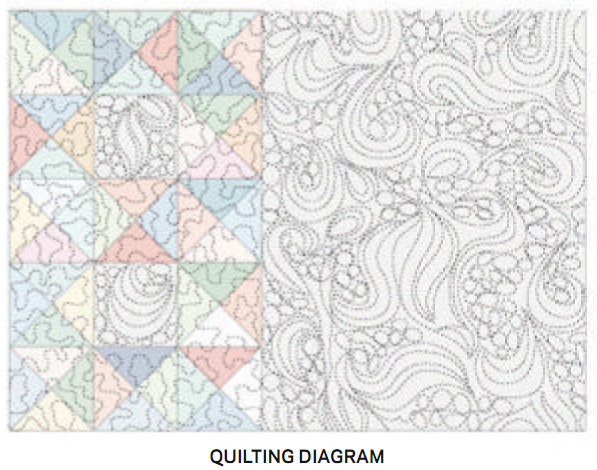 Quilt patchwork Tutorial ~ DIY Tutorial Ideas! A simple yet graphic throw shows it’s possible to successfully combine wovens and prints. A neutral solid marries the playful fabric mix. Yardages and cutting instructions are based on 42" of usable fabric width. Measurements include 1/4" seam allowances. Sew with right sides together unless otherwise stated. Cut pieces in the following order. Cut gray chambray border strips lengthwise (parallel to the selvages). Although the form of the block in Walk in the Park is the same as an hourglass block, the design and color placement are different. Designers intentionally avoided the placement of a traditional hourglass block, but rather randomly placed quarter-square triangles in a grid. If you want to take this block more traditional and make it a classic hourglass, choose fabrics with clear contrast for the opposing triangles. 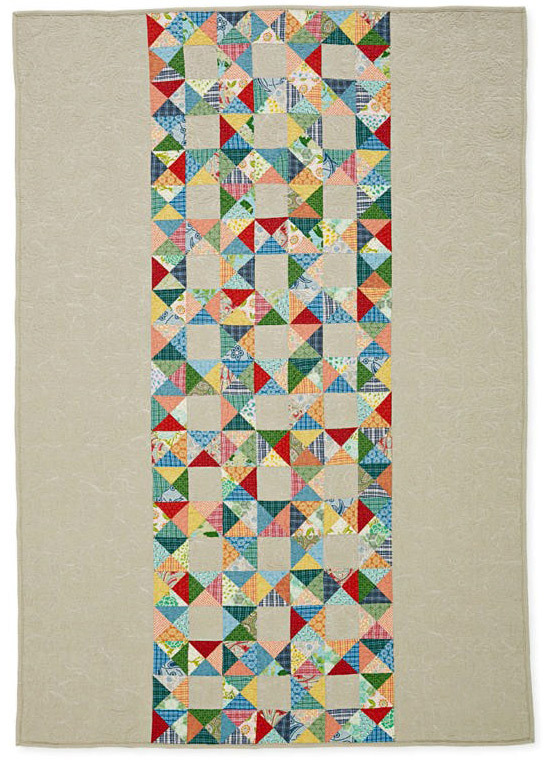 But if you want the center panel to read as more modern by making it one unit instead of a series of blocks, opt not to differentiate the opposing triangles so you don’t see the hourglass pattern. print or plaid 4 3/4" squares. 2. Layer a marked print or plaid square atop an unmarked print or plaid 4 3/4" square. Sew pair together with two seams, stitching 1/4" on each side of drawn line (Diagram 1). Cut pair apart on drawn line and press open to make two triangle-squares. Each should be 4 3/8" square including seam allowances. Repeat to make 118 triangle-squares total. 3. Cut each triangle-square in half diagonally to make 236 triangle halves (Diagram 2). 4. Layer two nonmatching triangle halves, aligning and pinning through center seams. 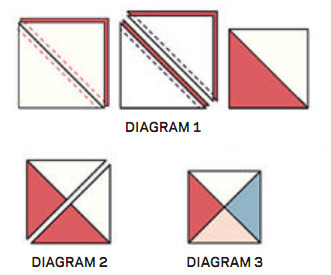 Sew together to make a block (Diagram 3). Press seam open. The block should be 4" square including seam allowances. Repeat to make 118 blocks total. 1. 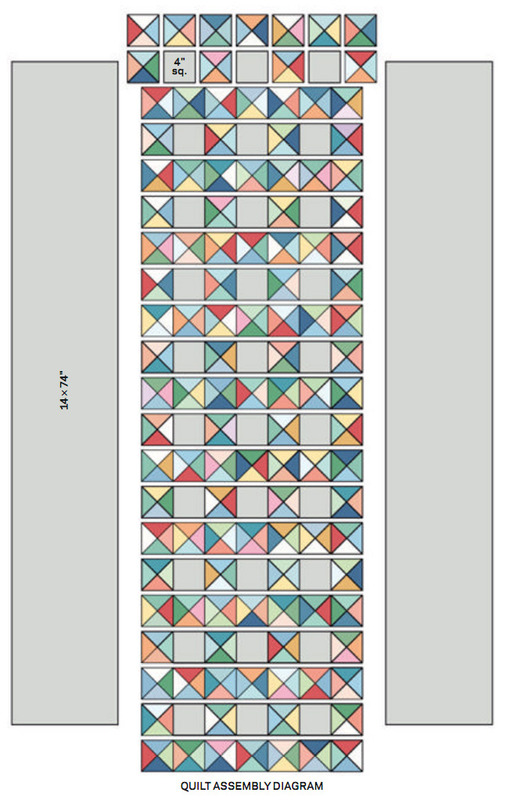 Referring to Quilt Assembly Diagram, lay out 117 hourglass blocks and the gray chambray setting squares in 21 horizontal rows, distributing colors evenly. 2. Sew together pieces in each row. Press seams open. Join rows to make quilt center; press seams open. The quilt center should be 25x74" including seam allowances. 3. Sew gray chambray 14x74" border strips to long edges of quilt center to complete quilt top. Press seams open. 2. Quilt as desired. Machine-quilted the blocks with stippling and stitched a swirl-and-pebble design in the setting squares and border (Quilting Diagram). 3. Bind with gray chambray binding strips. 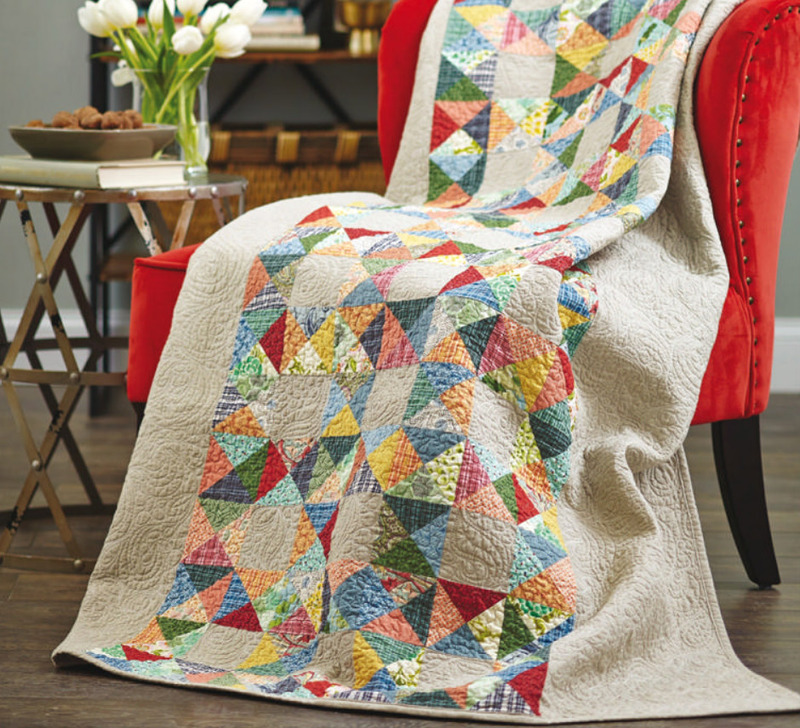 Beautiful scrap quilt ! I will make this using shirts of my friends husband. A memory quilt. Thank you for the idea.